This is an ideal place where couples or friends can relax in private for a romantic getaway. This lovely, fully renovated colonial cottage-style bed sit studio is fully self contained, and situated in an elevated 1 acre of grounds. right on Gregory Lane, a private lane which overlooks the town of Whangamata. This sweet little hideaway also has attractive polished wooden floors. It has a modern smart kitchenette and ensuite bathroom plus a hot water outdoor shower to wash off the sand from the beach. Your comfort and warmth is ensured with a heat pump and cosy electric blanket, plus a choice of summer or winter weight duvets and bed quilt. A flat screen TV and Freeview ensures quality viewing. Either relax outdoors on the two sun loungers, or use the table and chairs in the sheltered courtyard. A delightful bush walkway along the Moana-anu estuary with access from nearby Brenton Place, brings you out on the main road to the bridge and a short walk past the marina into the town for your latte and newspaper. 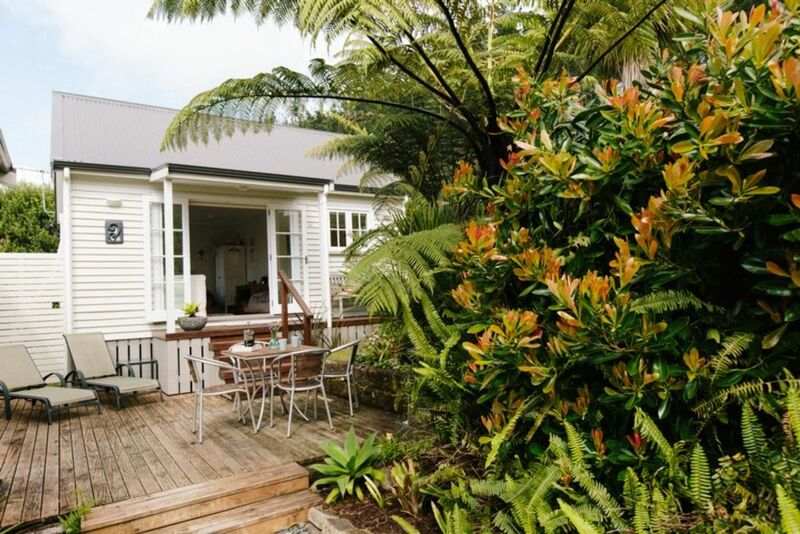 The Studio is adjacent to a restored colonial style kauri cottage holiday home but your privacy is ensured as you have use of the entire property. If the owners occupy their holiday home they would let you know of this in advance. Its set in a peaceful sheltered garden and orchard surroundings with native bird life, yet only minutes drive away from Whangamata's popular surf beach, shops, clubs, estuary / harbour, Wentworth Valley Regional Park and nearby golf courses. Its also well located to take day trips to explore Coromandel, or head south via a pretty coastal road to Tauranga and the fruit bowl country of Bay of Plenty before coming home to your own cosy and snug retreat,... this is just the perfect base for exploring the region ! Off Peak one night stays considered - inquire within. There is a microwave, electric fry pan and BBQ available. Fully equipped with crockery, cutlery, glassware, microwave, sandwich maker, electric frypan, coffee plunger. We loved this beautiful little studio. Nice to be out of town, but an easy drive in if you wish. We hiked Wentworth Valley to the waterfall, which was beautiful. We also headed to Opoutere Beach, which was empty and spectacular! What a beautiful area. My only suggestion is that it would be nice to have the option to pay a cleaning fee, in case one is on a tight schedule. Other than that, it was wonderful! We enjoyed the stay a lot. The appartment is nicely designed and well equipped. We stayed for 3 nights but it is definitely suitable for an even longer stay. The only negative is the missing WiFi connection. For locals with phone flatrate probably o.k. but for foreigners (we came from Germany) it is a bit uncomfortable. Glad you enjoyed your stay :) We have in the studio a console table in the kitchen area which has 2 fold out sides to make a table setting to seat 4. The 4 chairs are folded and tucked away inside the base of the console... I am sorry you didn't notice the function of this table. Delightful and well organised lititle cottage.lovely gardens.bit of road noise..very nice and easy place to stay at..we would definitely stay again.